Your tip is 100% anonymous. testify or appear in court. Submitting a tip is easy. Really. Thank you to Burlington Hyrdo and CN for their continued support of Crime Stoppers. On January 23, 2019, Crime Stoppers held their annual Crime Stoppers Month event. January has been proclaimed Crime Stoppers Month in the towns of Burlington, Halton Hills, Milton and Oakville. On August 29, 2018, a convenience store in Milton was robbed by 3 suspects. On Tuesday, November 26, 2018, please consider supporting organizations in your community. In the blink of an eye, any impaired driver can ruin lives forever. Horrific heartbreaking headlines of impaired driving aftermath never seem to end, and it affects us all. Worst of all, it is completely preventable. Crime Stoppers can help. November 6th through 12th marks National Senior Safety Week. In support of National Senior Safety Week, the Canada Safety Council has compiled information on technology scams that frequently target seniors. Halton Crime Stoppers wishes to share some of this technology scam information and reminds everyone to remain vigilant and on the lookout for fraudulent activity. In the early morning of June 25, a robbery occurred at the Esso/Circle K on Guelph Line in Burlington, ON. Crime Stoppers visited our friends at Filebank Canada to present them with a token of thanks. Halton Crime Stoppers’ Fall Shred Events will take place on Sunday, September 16, 2018 in Milton and Georgetown. Crime Stoppers of Halton is looking for Community Partners that are seeking to keep Halton one of the safest communities in Canada. Crime Stoppers of Halton launches hard-hitting public awareness campaign. Crime Stoppers of Halton’s annual Spring Shred fundraising events are fast approaching! Crime Stoppers is pleased to confirm 2 Shred Events this Spring: May 26 in Burlington and May 27 in Oakville! Crime Stoppers of Halton has joined many Crime Stoppers programs in the switch to a new tip management software called P3 Tips. As a result, our links to web tips have been updated. As Halloween approaches, Halton Crime Stoppers wants everyone, young and old, to have a happy and safe celebration. Burlington Chambers is having a Trade Show Event and Halton Crime Stoppers will be attending this event amongst other organizations. For a donation to Crime Stoppers of Halton, area residents can safely dispose of financial documents and personal papers to help combat identity theft. Everyone is invited to bring any confidential records, including bank statements and old tax returns, to Sobeys grocery store parking lot at 1035 Bronte St South. 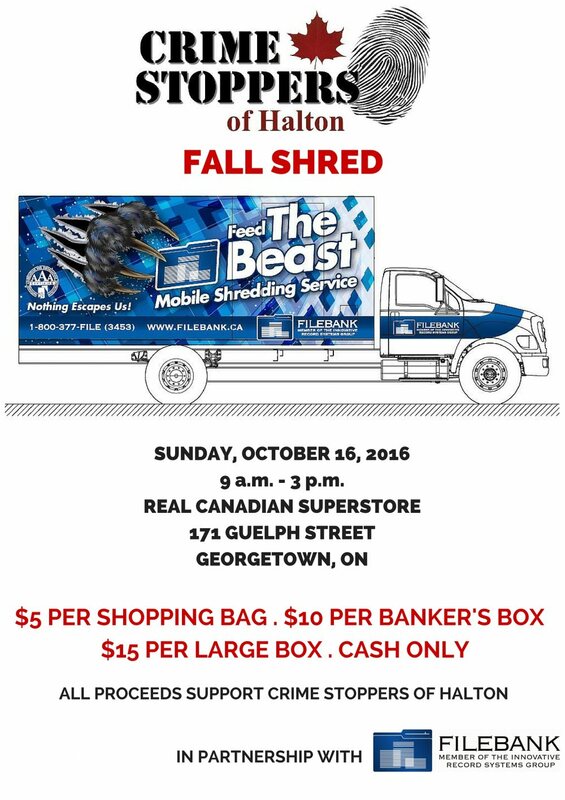 In Milton, on Saturday, September 30th between 9:00 a.m. and 3:00 p.m. to “Feed the Beast” – FileBank’s state-of-the-art mobile shredding machine for a monetary donation to Crime Stoppers of Halton. For a donation to Crime Stoppers of Halton, area residents can safely dispose of financial documents and personal papers to help combat identity theft. Everyone is invited to bring any confidential records, including bank statements and old tax returns, to the main parking lot of the Halton Region Centre, 1151 Bronte Road in Oakville on Sunday, April 30 between 8:30 a.m. and 3:30 p.m. to “Feed the Beast” – FileBank’s state-of-the-art mobile shredding machine for a monetary donation to Crime Stoppers of Halton. On Friday March 31st, 2017, Oakville MPP Kevin Flynn and Chair of OTF’s Halton-Peel Grant Review Team Mark Emmanuel presented a plaque to Crime Stoppers of Halton Chair Doug Maybee in recognition of a $14,800 Capital grant from the Ontario Trillium Foundation (OTF) to Crime Stoppers of Halton. A special thank you to all that joined the Crime Stoppers of Halton crew last night for Eagles tribute band Hotel California benefit concert March 30th, 2017 for Crime Stoppers of Halton. Royal Canadian Legion Bronte Branch 486 donates $1,000 cheque to Crime Stoppers of Halton. Presenting the cheque is Branch 486 President Fred Norman and 2nd Vice Mary Nieuwpoort to Crime Stoppers of Halton Chair Doug Maybee (LCDR, RCN Ret’d) and board member Wally Trapler. Crime Stoppers of Halton thanks CN for becoming a proud supporter of Crime Stoppers of Halton Billboard Sponsorship Program. At the CN Milton office, Crime Stoppers of Halton Board Chair Doug Maybee, thanks CN for its continued support of Crime Stoppers of Halton alongside Wally Trapler, Crime Stoppers of Halton board member and retired CN Police Officer and Drew Redden, CN Ontario Lead of Community Affairs. Halton Crime Stoppers has been honored by Crime Stoppers International with three media awards for coverage provided by community newspapers. On March 18, 2019, a commercial break and enter occurred at a convenience store located at 2365 Trafalgar Road in Oakville. On January 16, 2019, two unknown female suspects attended the Sephora located at 900 Maple Avenue in Burlington. Police are seeking assistance from the public in helping to identify suspects wanted in a home invasion in Milton. Halton Regional Police are investigating two lefts of automated teller machines (ATMs) in the town of Oakville. Police are seeking the identify of a suspect in connection with a serious assault that took place in the City of Burlington. On November 20, 2018 at approximately 1:55am, the suspect pulled up to the Pet Valu at 1235 Fairview Street in Burlington driving a beige or tan older model Plymouth Breeze. On Thursday, November 29, 2018 at around 2:30pm, the two suspects pictured below committed a Break & Enter at a lakefront house on Sherbourne Place in Oakville. Within four days, four different apartment buildings in Oakville had units entered and property stolen. On October 12, 2018, a suspect stole credit cards from a vehicle parked at a Boston Pizza in Burlington. Sometime between early August and September 22nd, a rear license plate was stolen from a vehicle in an apartment lot on Lynwood Dr, Oakville. This license plate is ON marker ASWB 750. On September 21, 2018, shortly after 5:00am, officers were dispatched to a gas station at 620 Thompson Road South in Milton. On March 27, 2018, police were contacted by a business (Noble Trade Contractors at 8699 Escarpment Way) after they discovered that an exterior locker had been broken into and approximately twenty gas cylinders had been taken. Detectives from the Halton Regional Police Service 2 District Criminal Investigations Bureau are seeking the identity of a male responsible for a commercial break and enter at a ‘Burger King’ Restaurant located at 2460 Winston Churchill Blvd in the Town of Oakville. On July 24, a robbery occurred at the TD Bank on 1505 Guelph Line in Burlington. Halton Police are seeking witnesses to a vicious assault that took place shortly after 2:30am on August 11, 2018 in Burlington. In the early morning of June 25, a robbery occurred at the Esso/Big Circle at 1170 Guelph Line in Burlington, ON. On February 3rd 2018 shortly after 4:00 PM, police responded to Bluffs Way in Burlington after an anonymous 911 call was received reporting a male putting a gun into the back of a vehicle. Between approximately 1:00 am and 4:00 am on August 2, 2018 there were five residential break and enters in the area of Sixth Line and North Service Road, Oakville. On August 30, 2017, police were contacted by a resident after they noticed the rear door to the garage had been kicked in and the entrance to the residence from the garage was unlocked. A store on 1400 Plains Road East (Burlington Electric Scooters) was broken into on the night of November 13, 2017 at approximately 2:00am. The suspect is believed to have stolen a 60V 20 AMP Lithium battery (Brand: Enginely). The battery is turquoise in colour and approximate dimensions of 12”x5”x3”. This item is used to power mobile scooters. On December 31, 2017, two male suspects entered at the rear of Sport Check, Georgetown Mall (280 Guelph Street, Georgetown) at approximately 3:00am. The suspects were observed on surveillance cameras drilling 2 holes into the steel door to gain entry to the interior latch. The complainant, Marc LEBLANC, is the owner of Pools for Home Design and Construction located at 1260 Speers Road in the town of Oakville. The complainant reported his vehicle stolen on Monday 06NOV2017 at 12:00 pm. The complainant advised he last saw his vehicle on Friday 03NOV2017 at 5:30 pm. A family home became the victim of a break and enter. Police are on the lookout for the culprits who are responsible for a break and enter that occurred on February 03, 2017 at 8:10pm located at 724 No. 22 Side Road in the Town of Halton Hills. The suspects entered the house through an unlocked garage door and used an axe , found within, to force entry into the home. The suspects rummage throughout the entire house and stole a television, several other electronics, and jewelry. A 69 year old female victim was approached by suspect who grabbed purse from her while walking to her car at a commercial plaza located at 2421 New Street (Guelph Ln/New Street). During the struggle for her purse, the victim was thrown to the ground where she sustained minor injury to her arm. Victim’s purse and its contents were stolen. Suspect fled seen and was riding a bicycle. On at least 19 occasions between July 2016 and August 2017, the same suspect has attended hotels or restaurants in Halton and stole purses from the backs of chairs. The suspect pretends to talk on a cell phone while walking around the hotel/restaurant, and carries his jacket in his hand. When he observes a purse draped over the back of a chair, he casually approaches it while talking on his phone. He then discreetly covers the purse with his jacket and lifts up the purse which is concealed beneath the jacket, and then walks away with the stolen purse. Halton police are investigating multiple incidents involving thefts from vehicles and damage to vehicles that occurred in the Yolanda Drive and Upton Court neighbourhood of South Oakville. During the overnight hours of November 22nd/23rd a lone suspect entered unlocked vehicles and stole items including any available cash, at least 15 vehicles were targeted by the suspect. The suspect also slashed tires on many of these vehicles. Sometime between 6:00 p.m. on Thursday, November 12, 2015 and the morning of Friday, November 13, 2015, unknown suspect(s) attended Gordon Enterprises located at 11553 Tenth Line in Georgetown. The suspect(s) removed batteries from one dump truck and one transport truck before fleeing the premises. Break and enter – 16-22579 – Halton Regional Police Service is investigating a Break and enter in the Town of Milton. On January 23, 2016 staff at Kelso Conservation was alerted to a damaged fence on the conservation property located at 5301 Steeles Avenue West. Between April 13- April 14, 2016 unknown suspects attended Digirolamo Greenhouse located at 8890 Eighth Line, Halton Hills. Break and enter - 16-123020 – Halton Regional Police Service is investigating a break and enter to a restaurant in the Town of Oakville. recent shred events in Burlington and Oakville. Our Community Partners... Thank you! We could not succeed without you. Thank you to our tipsters, community partners and sponsors.